Houston Mayor Annise Parker does her first skydive at Skydive Spaceland-Houston, Jan. 4, 2015. See more photos on our Facebook page! (Rosharon, Texas, Jan. 6, 2014)–Not every business does team-building activities, and those that do don’t often plan something as intense as skydiving. 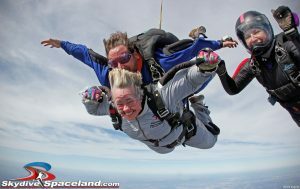 You certainly wouldn’t expect it out of a government office, but Houston Mayor Annise Parker brought no fewer than 20 employees, City Council aides, and others to skydive and bond at Skydive Spaceland on Sunday, Jan. 4, 2015. The group did tandem skydives harnessed to experienced instructors from about 14,000 feet (2.6 miles high), freefalling at 120 mph until about 6,000 feet. Parker, who jumped with experienced instructor Henry Prewitt and videographer Daniel Angulo, also had a freefall visit with literal hand-holding from Helaine Rumaner, a city employee and competitive skydiver who has done more than 2700 jumps. Experienced skydiver Chad Hall also flew with the group for an additional video perspective. William Paul Thomas, liaison to the City Council, had the idea to try skydiving as a team-building activity several months ago. Despite two date changes over seven months, most of the participants remained excited to jump and 20 of the original 30 participants jumped on Sunday. Two even jumped twice that day, and several more purchased a same-day special for a later repeat jump. The staffers covered the jump costs (and those of their other team-building events) out of their own pockets. Previous PostPrevious Skydiver Training Tip: What If You Have to Repeat a Dive?